Valentine's Day is around the corner. I have a stern double warning to dating couples: First, do NOT cohabit. Second, consider marriage instead. Parents of young adults: Pay attention! Do not accept your child's suggestion that they live together. Give them the evidence in this column that they are playing with fire. They and especially their children - will fare poorly. In 2015, 8.3 million couples were cohabiting, but only 1.3 million of them married. What happened to the other 7 million couples who were living together? In time, most break up. Yet 39% of cohabiting couples have children - virtually the same as the 40% of married couples who had children. How do the children of cohabiting couples fare in life? Children born to unwed parents are 102% more likely to see their parents break up by the age of 12 than children born in wedlock, according to a new study by W. Bradford Wilcox and Laurie DeRose, "The Cohabitation Go-Round: Cohabitation and Family Instability Across the Globe." Wilcox, who is a senior fellow of the Institute for Family Studies and a professor of sociology at the University of Virginia, says that 2.5 million kids are living in cohabiting homes - up more than 12-fold since the 1970s. In fact, cohabitation has become so popular that American children are more likely to experience cohabitation than divorce! "Children of divorce are more likely to cohabit," he says. "They are often gun shy about marriage and see cohabitation as an opportunity to learn about their partner, or avoid the heavy duty commitment that comes with marriage." But why are cohabiting couples having children - when they have not made a full commitment to one another? One reason is that fewer are religious. More important, they have not considered the impact of their cohabitation on their own children. About two-thirds of young adults now cohabit, and 59% of those marrying are living together. However, the percentage of cohabiting couples who marry is relatively few. The number of never-married Americans nearly quintupled from 8.7 million aged 25 and older in 1970, to 41.3 million never-married in 2015. There were only 2,077,000 American marriages in 2015 - fewer than the 2,159,000 in 1970! If the same percentage of adults were marrying today as 45 years ago, in 1970, there would be 1.3 million more marriages per year now. In 1960, 72% of all households were headed by married couples. In 2015 only 48% were led by married couples, according to Census. Cohabitation is the major killer of marriage in America. And those who cohabit before marriage are 61% more likely to divorce than those who remained apart until marriage. Why doesn't cohabitation work? My wife and I wrote a book, Living Together: Myths, Risks & Answers. We quote David Gudgel who wrote that in cohabitation, individuals usually focus on "obtaining satisfaction from the other person. However, in marriage, spouses tend to focus on giving satisfaction to the other person." In the process of giving to one's spouse, the giver receives joy as a byproduct. We wrote, "Love in a marriage is an investment. In cohabitation it is a gamble. "Cohabitation is conditional. Marriage is based on permanence. "These are radically different psychological premises for a relationship. "True love is selfless. Cohabitation is based on selfishness." 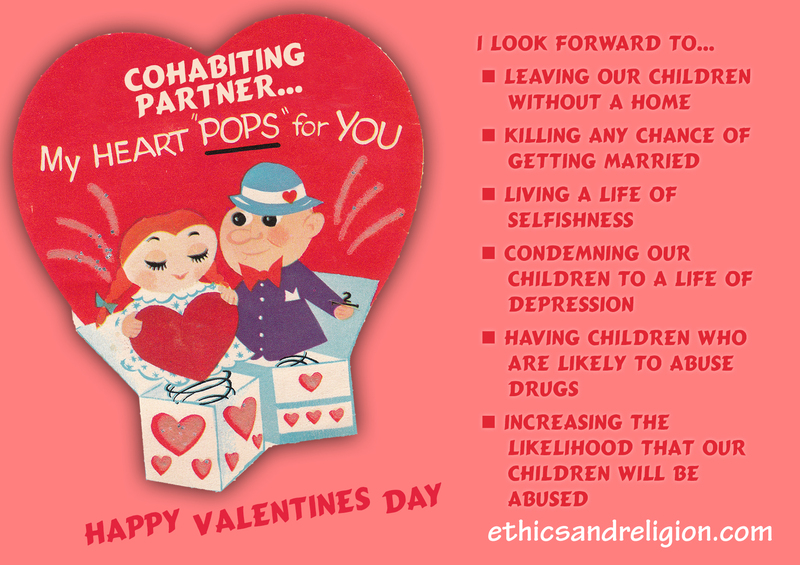 No one is more hurt by cohabitation than children of couples living together. "Children in cohabiting families are significantly more likely to suffer from depression, delinquency, drug use and the like," Brad Wilcox reports. For example, they are twice as likely to use drugs compared to those living with married parents. "In fact, children in cohabiting stepfamilies did worse on this outcome than children in stable single parent families." This is surprising. One might think that a child living with their mother and father - will fare better than a child raised by a single mother. Children of cohabiting parents have access to both parents and both genders. However, their parents are not committed to one another since they did not marry. Wilcox also reports that "The most dangerous situation is one where a mother cohabits with an unrelated male boyfriend." A recent federal study reported that those children are "about 10 times more likely to be physically, sexually or emotionally abused compared to children living with their own married parents." Therefore, this Valentine's Day, if you are in love - propose marriage. Avoid the hell of cohabitation, at all costs. You can't practice permanence.